A CollegeGrad.com survey has named Enterprise Rent-A-Car as the No. 1 Entry-Level Employer. With 8,900 projected entry-level hires for 2016, Enterprise Rent-A-Car is predicting an overall increase in their 2016 entry-level hiring. Entry-level employers are predicting an overall increase in hiring of 2.3% in 2016, according to CollegeGrad.com. 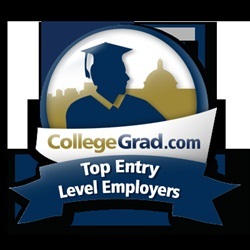 CollegeGrad.com’s Top Entry Level Employers list represents more than 125,000 entry-level jobs for the graduating class of 2016 and is available online at CollegeGrad.com/topemployers. It details the 2016 entry-level hiring plans for more than 400 employers and includes links to entry-level and internship job postings for each employer. The list includes many top entry-level employers from previous years, such as insurance companies Liberty Mutual and Cigna, tech giants Amazon, HP, and EMC, and accounting firms EY and KPMG.